If you are planning to visit NYC any time soon and find yourself starving after a night of glamorous club hopping, there is a restaurant that serves delicious food with fierce atmosphere! 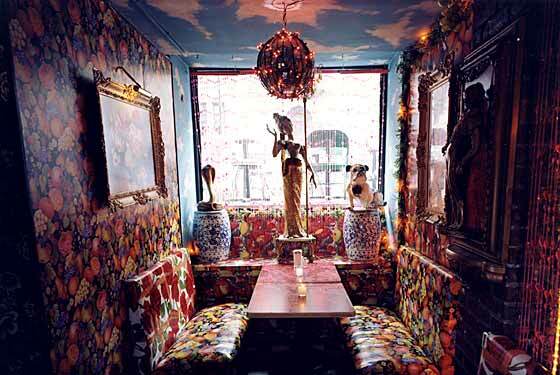 Yaffa Cafe is on Saint Marks Place in the East Village and has been around forever. They are open 24 hrs. so if you are there in the wee hours of the morning, you are sure to see an eclectic mix of drag queens, indie rockers and business men. They serve everything from hummus plates to veggie wraps to pasta dishes, and the prices are very reasonable. There’s a huge outdoor patio to dine in as well. It’s definitely one of my favorite places in the city to grab a bite and take in the vibe that makes NYC so special. Hope everybody’s week is off to a great start!